Historic Kirchem Tree Farm | The Magic of Christmas Begins At Our U-Cut Natural Tree Farm! The Magic of Christmas Begins At Our U-Cut Natural Tree Farm! Due to the nature of growing trees it takes 7 to 11 years before a variety can mature enough to be harvested. We will be open in 2019 for another short season. And don’t forget to join us this next fall for the Pumpkin Patch, Hay Maze, and Wagon Rides in October! The best thing about being a Christmas Tree Farm is looking forward to having all of our beautiful loyal families arriving and letting us be part of their personal traditions. We appreciate all of you and are grateful for your support over the years. Best Wishes for a very Merry Christmas and Holiday Season. 2018 UPDATE – As trees grow and are cut our focus changes almost every year. Our smaller sheared cultured Noble fields are depleted for 2018. If you only require a small 3′ or 4′ tree then our fields simply can not accommodate you this year (2018). Growing trees means each field changes Every Year. We Are Closed Now for the 2018 Season. Trees grow for an average of 7 years to 11 years of age before they are cut and become part of the Christmas Magic in your homes. Fields need a rest before replanting, and other fields are growing. Ready to harvest fields change every year by varieties and tree sizes. None of our trees are sprayed! We have both open pastures and tree fields for your family to explore. The Historic Kirchem Farm is only a few miles from Carver Bridge in the heart of the Christmas Tree Capital of the WORLD! It is heart warming to think of our trees in all the homes on Christmas morning . . . decorated and witnessing all the joy and love that fills a person/family’s heart. Thank you for making us part of your family traditions. We appreciate each and everyone of you! We love seeing pictures you’ve taken at our farm. And we love seeing our Historic Kirchem Farm trees decorated and set up in your homes. Please enjoy this link to our FaceBook Page and use it to post, share and tag all your pictures, videos and traditions! The interior of the new Warming Shed!!! We are still where the Historic Kirchem Farm has been since the mid-1800’s. We still have stunning outdoor venues for weddings and reunions, and of course our non-sprayed U-cut Christmas trees. 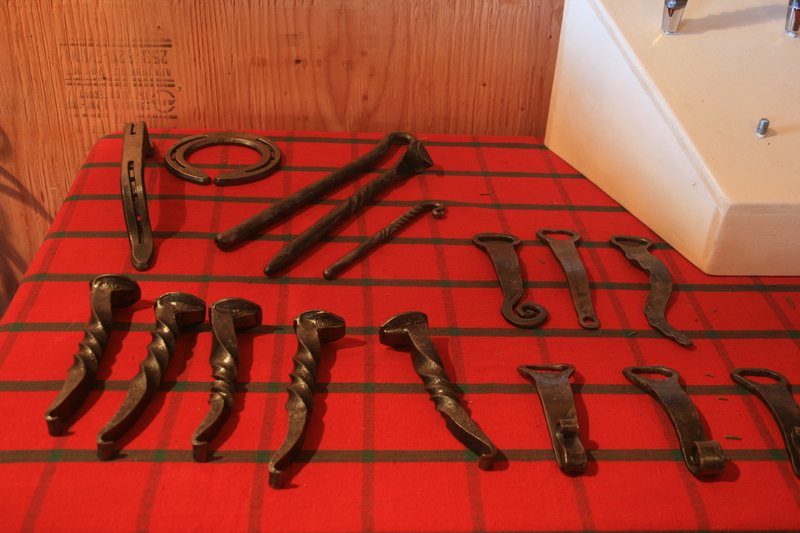 Brian’s Metalwork and Blacksmith gifts are so popular Brian has expanded his product line. Stop by the Warming Shed and take a look. Over the river and through the woods . 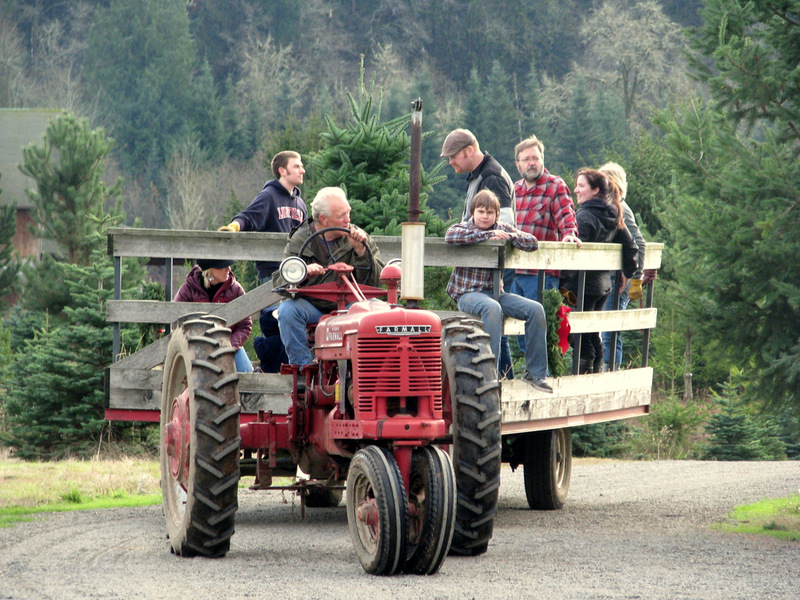 . . discover the magic of Oregon City’s Historic Kirchem U-cut Tree Farm. Our trees are NATURAL! Now CLOSED FOR 2018 Season. We open Weekends the Friday after Thanksgiving – 9am to 4pm! You are invited to join us and share the Magic of Christmas that radiates across our 100 acre u-cut natural tree farm. We strive to create a simple happy Country Christmas visit for you and your loved ones. 2018 UPDATE- As trees grow and are cut, our focus changes every year. At the moment we are specializing in taller trees. Oregonian’s favorite tree is our state tree and we have a gorgeous plentiful selection of Douglas Fir 6 to 8 feet tall for $35.00 each. Reminder: Please try to not enter the tree fields after 3:30 PM. It is too easy to fall over little tree stumps in low light, or misplace part of your family! The Pay Station and fields close at 4PM. Dress warm! If you only require a small 3′ or 4′ tree then our fields can’t really accommodate you this year. Growing trees means our fields change Every Year – it’s a tricky business but we love it! We Have Several Wonderful Varieties Of Natural Non-sheared Christmas Trees. They Stand Proudly In The Fields Waiting To Bring The Magic Of Christmas Into Your Home! We grow beautiful natural non-sheared trees – NO SPRAY! We strive to be as environmentally conscious as possible. 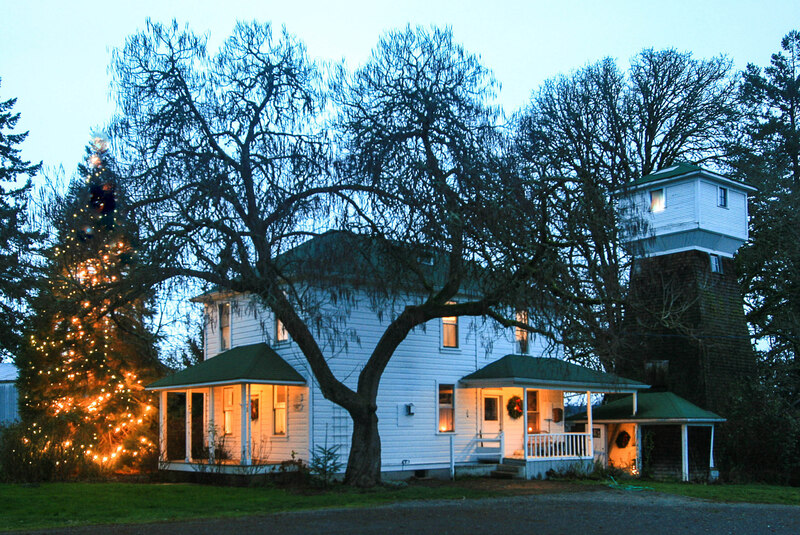 Our historic farm has been featured in Sunset Magazine, KOIN6 TV, Clackamas County’s Summeryule tours, even a Norm Thompson commercial, and our trees star in thousands of town squares and living rooms across the region. We will help you decide which tree best serves your need. Be sure to start your adventure at our warming shed. There you will learn how to identify the differences between the trees and get headed in the right direction. Everyone has been busy getting ready for your visit! The horses are excited to have their stalls decked out. The little fox at the edge of the farm shyly agreed to wear a Santa hat. The U-Cut Shed has the fire stoked to warm guests with hot cocoa. Giant Gingerbread Cookies are available to purchase! Your hosts, Reg and Cher Tollefson, are smiling at the thought of all our wonderful visitors arriving soon . . .
Free exciting tractor hay wagon weekend rides – weather permitting! Copyright © 2015-Present Historic Kirchem Farm All Rights Reserved. This site was created for the Historic Kirchem Farm by Kris Tabor ~ Kris Tabor Photography.